Your Custom Printed Picture Compact Mirror measures 2.5" x 3". Includes FREE Personalization. 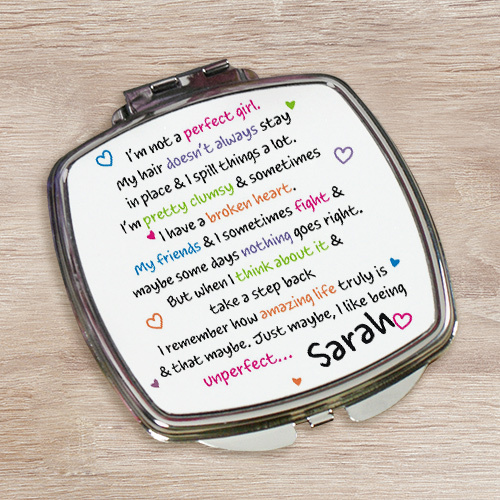 Personalize your Compact Mirror with any name. Compact Mirror measures 2.5" x 3"
I bought two of these for my daughters. They're adorable, well made as are my daughters. ;-) I would recommend these and hope to buy more as gifts. I love this I got it for myself! I bought this as a gift for a dear friend and she cried reading it! I love the message, but the words seemed a little fuzzy. GiftsForYouNow.com has many additional Personalized Photo Gifts for your special gift giving needs. We create beautiful Custom Printed Photo Gifts your Mom, Grandma, Aunt, Sister or Best Friend will absolutely love. Think outside the box with unique, Personalized Photo Gifts from GiftsForYouNow.com.